Dr. Harvey Passes and the team of doctors and staff at Passes Dental Care have been serving the Great Neck, Manhasset, and Roslyn, NY areas for more than 42 years, providing individualized and comprehensive dental care to all our patients. Offering services such as general and cosmetic dentistry, Invisalign treatment, endodontics and periodontics, dental implants, and sedation dentistry, we ensure the needs of each patient are met while providing a comfortable, stress-free experience. At Passes Dental Care, we make your comfort our top priority. If you’re one of the many who utilizes sedation dentistry to help manage dental phobias, you’re not alone. Fear of the dentist is normal, but we can help you overcome it. 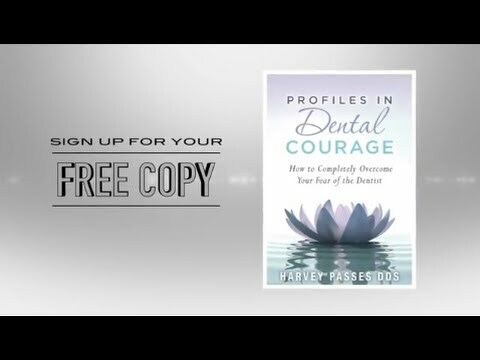 For a limited time, you can receive a free copy of Profiles in Dental Courage and learn how to overcome your fear of the dentist once and for all. Simply fill out the information below to request your free copy today! Within this book is highly specialized information not commonly available to the public, but for the first time, you now can learn the secrets to overcoming dental anxiety! See how other dental patients just like you have overcome their fear of the dentist. Dr. Passes has more than 42 years of dental experience, has operated his own dental phobia clinic, and has seen first-hand what has and has not worked for his patients. Trust the expert — request your free copy of Profiles in Dental Courage today! When you’re ready, Dr. Harvey Passes and the team of experts at Passes Dental Care will be here to help you overcome your dental phobia. If you’re interested in learning more about this or one of our many other dental services, such as Invisalign, cosmetic dentistry, or just general dentistry, please don’t hesitate to contact us with your questions. Give us a call today at 516-858-5921 to schedule your appointment. We look forward to hearing from you!